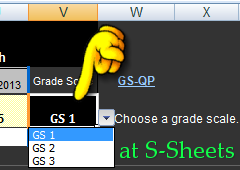 Set the grade scale for each class after viewing and possibly editing the grade scales at GS-QP. 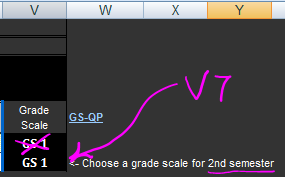 By default, all grade scales are set to GS 1. 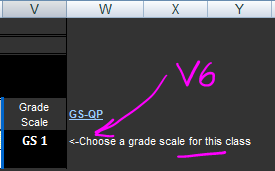 At s-sheets 1-6 you should check cell V6 to make sure it is set to the correct grade scale. The choices are GS 1, GS 2, and GS 3. 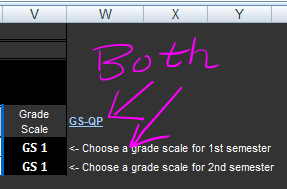 The choices refer to the grades scales at the GS-QP worksheet. At the split s-sheets, 7-10, check cells W6 and W7. I programed the cells to let you know, with a message and an arrow, which drop-down to use. See images below. This should be done only if the student is earning credits. 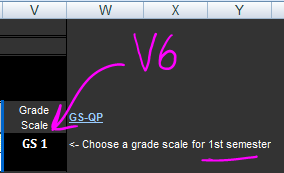 The scales may be adjusted at the GS-QP worksheet. There is no need to make a QP selection if the credit has no value. To set the quality points in s-sheets 7-10, select the scale based on how the s-sheet is used and make no selection if the credit has no value. When the divided s-sheet (split s-sheet) is being used as “Split”, then look for the QP drop-down lists in cells L1 or/and L2. Below (image #4) – a divided s-sheet (split s-sheet) that is being used for a full-year class. The QP selection is in cell I4.